A well-dressed attendee at Fashion Week. 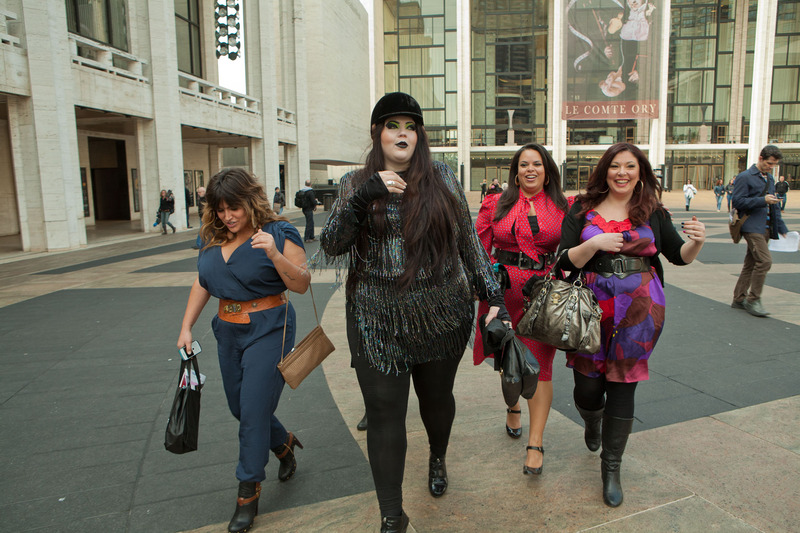 As I was leaving, a group of plus-size women came through the plaza, looking unexpectedly happier than most of the fashionistas coming in and out of the shows. Someone asked them if they wanted to be on the runways, and they said yes, indeed. This reply was greeted with general and widespread support. I was not able to stick around long enough to hear the M-B Fashion Police Force interview them, and I while I spent some time trying to find a video of the interview, I drew a blank. I’d have expected a more public, if not viral, showing. Ah, well. So it all got me thinking about the evanescence of fashion, and the differences between fashion and style. If you care about these things, or even if you have just a passing interest, you should check out The Sartorialist, Swagger 360, and, of course, teh late Bill Cunnigham’s observations in his “On the Street” at The Gray Lady. More photos of the last day of Fashion Week 2011. Technical note for gearheads and the merely curious: The photos at Lincoln Center were taken with a Canon 5D, Canon 24-70mm lens, some with the addition of an off-camera fill flash held in my hand. Photos of Derek Lam’s trash taken with my current walking-around camera, an Olympus E-P2, with the kit 14-42mm lens.